Windows let in light and offer beautiful views for your Gold Coast home. However the light they let in can also be a cause of hot-spots and severe fading of your house’s furnishings. Our products are designed to reject solar heat, reduce the effects of fading, and provide an extra measure of safety in the event of glass breakage. The Gold Coast is a very hot place in summer. Window tinting blocks 99% of damaging ultraviolet rays without reducing the amount of light entering your home. This protects your family and friends from skin and eye damage. It also reduces fading of your home furnishings and fabrics. Untreated windows allow UV rays into your home that fade and weather your carpets, furnishings, and valuables. Window Tinting can lengthen the lifespan of all your belongings, keeping you happy and comfortable. Home window tinting can reduce the heat accumulated by your home by as much as 78%. This makes your home cooler and more comfortable during our hot Gold Coast summers. The decrease in heat can also drastically reduce the cost of utility bills. With energy prices as high as they are, and continually on the rise, we can all use a little extra cash. Glare can also be blocked from entering your home. Annoying glare can make things like watching TV, or talking to a family member, a huge effort. Without darkening your home, this glare can be easily prevented if you choose the right window tinting film. 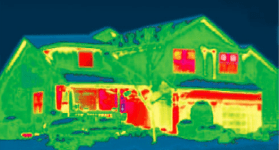 The image below shows the heat loss through your windows during colder months using a thermal imaging camera. In up to 64% of burglaries, intruders gain access to the premises by smashing through exterior glass. Applying window tinting to your windows makes it harder to shatter glass and gain entry. The adhesive in the window tint holds broken pieces of glass together. In this same way, window tinting comes in handy during extreme weather events. Debris from damaging winds normally flies through windows with ease. Window tinting can aid in keeping unwanted fragments out of your home while protecting your loved ones from flying shards of broken glass. Home window tinting can protect your house from the scrutiny of curious onlookers. It can block the vision of those outside, while still allowing those inside the home to see outdoors. This can hide your most valuable possessions from unwanted eyes and prevent burglaries simply because people do not know what you have in your home. New technology in window films allow you privacy and high heat rejection and still allow you vision at night! With most home window tinting films, heat rejection is obtained through high metallization and reflectivity. This causes ‘negative reflectivity’ at night. That means the reflective look you see from the outside of your home during the day, causes the same reflective look when trying to see out of your windows at night. Choosing the correct film is extremely important if you have a view you would like to preserve your home’s view of a lake or waterfront, nature preserves, river frontage, or landscaped gardens. Most quality window films come with lifetime warranties, specialty films and decorative films have shorter warranty periods compared to the solar films. Please ask for more information about the warranties available on the films that are best suited to your application.